Coffee and a Book Chick: Key West...and What's In for Monday? Holy cow, I clicked on the link and couldn't believe all those Hemingways! What a riot! That must be so fun!!! COOL!! I had no idea this existed with the fun look-alike contest and all. Good luck to your father. I hope he takes the prize next year! How did he not win? He looks just like him! LOL! That is possibly the most awesome contest ever! Thanks for stopping by my blog today! I hope you don't mind, but I am going to tweet this post because this is the coolest post I've read in awhile! I hope your dad wins next year! Key West is a perennial favorite of mine and I wish I had been there this year to cheer him on! Andi -- Thanks!! We are crossing our fingers and hoping for next year -- the fun of going and cheering is the best part, but hopefully we can get a win out of it!! Carin -- It is an absolute blast to attend! Oh, and I would love it if you tweeted the post, what a compliment! Thank you so much!! Thanks so much for stopping by my blog today. I look forward to following your posts in the future. I found your blog through your comment on Literary Musings. Looks like our taste in books is really similar! I am looking forward to hearing what you think of The Monsters of Templeton. I've been to Florida but never Key West. Now you have me intrigued! Hemingway look alike contest! That's awesome! Too bad you're dad didn't win - he resembles him quite a bit! It sounds like a lovely vacation. What a great contest! Sounds like you had a good time out there on your holidays. The contest sounds like so much fun - I can't believe your dad didn't win it. You should read Turtle in Paradise - it's a middle grade book, but it's set in Key West and it's full of great characters. Goodness, how do the judges decide? Those men all look pretty much like Papa to me! I hope your father wins next year. Besides the honor, what other prizes would he get? Molly -- Thanks so much for swinging by!! Yes, retire to Key West and your husband should compete! I assure you, it is so much fun! Kathy -- Thank you for visiting! I love Literary Musing's site! Glad we could meet up through that blog, and my thoughts on The Monsters of Templeton should be in the next couple of days! Please stop by again! Connie @ SogniESorrisi -- You must go to Key West! I am very confident you'll like it! Aarti -- You are so right! Literary look alike contests, and particularly this one, are too much fun! And I do think much more fun than the Elvis impersonator -- these old guys during the Hemingway Days are hilarious! Leeswammes -- Thanks! I had a fabulous time, way too much fun! Bermuda Onion -- Ooh, thanks for the tip on the book! Anything set in Key West is right up my alley! I would have voted for your dad! What a fun event! I love visiting writers' houses. Have you seen the new site that talks about them? I think you'd like it...http://writershouses.com/contents/. And speaking of visiting, thank you for coming by my blog and all your thoughtful comments! Audrey -- Thanks for the tip on that site! I love it!! And thanks for sending a virtual vote -- I think next year will be *the* year! Bellezza -- I agree! I've visited his home twice and love it, especially his carriage house/study. Of course, the six-toed cats were fun, too! WOW What FUN!!!! And your Dad is such a Hemingway look-a-like!!!! Does he read A Farewell to Arms just to help tuck you in? LOL! He's got to win next year...Heck if it helps I'll come to Key West in July to be a supporter and fan of his! We just went in April for 4 nights and of course spent quite some time at Sloppy Joe's! Any excuse to party in the Keys...let me know and we'll be there!!! 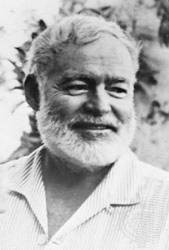 oh, and by the way, i think that is too cool that your dad will get in a Hemingway look-a-like contest. Your dad has got to be the coolest literary dad around! What a hoot! I cant believe he didn't win... did they let actual relatives enter? Anyway, what a great way to spend a vacation, celebrating Hemingway, spending time with your dad, and visiting Key West. Now here's an idea - didn't Hemingway spend some time in France? Tae your dad to France and see if they remember him. post the outcomes in next years Paris in July! @ Nadia -- Oh, my thanks for stopping by! And thanks for the link!! I'm so thrilled that it made The Guardian!! What a great article -- I'm forwarding out to my family, they will love this!! That's awesome! I've always wanted to see that contest. Funny, I'm also reading The Handmaid's Tale right now and The Tapestry of Love up next. Can't wait to hear your thoughts on both.